Wages will rise and unemployment will fall if Britain leaves the EU and regains control of its borders, an ex-Treasury minister and Tory rising star declares today. In a powerful intervention that will rattle No 10, Andrea Leadsom says the UK’s ‘best days lie ahead of us’ if the public ignores the doom-mongers and breaks free of the shackles imposed by Brussels. 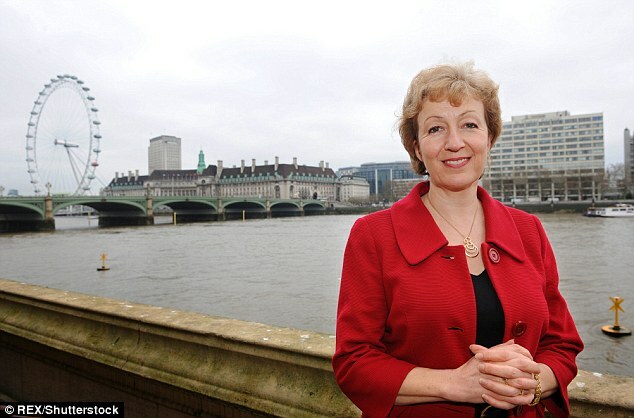 Mrs Leadsom, an energy minister tipped as a future leader, said the reason many big businesses were backing the Remain camp is because they want to keep down the pay of British workers. In an article in today’s Mail, she writes: ‘To my mind it is totally unacceptable that big businesses have, for more than a decade, been holding down the wages of UK workers by employing more and more EU migrant labour. The latest opinion poll gives Leave a four-point lead. In her exclusive article, Mrs Leadsom dismisses warnings from a succession of ministers that Britain’s economy will be imperilled if the country votes out on June 23. Her intervention is hugely significant because she spent more than a year working for Chancellor George Osborne as Economic Secretary in the run-up to last year’s election, before moving to be minister of state at the Department for Energy. 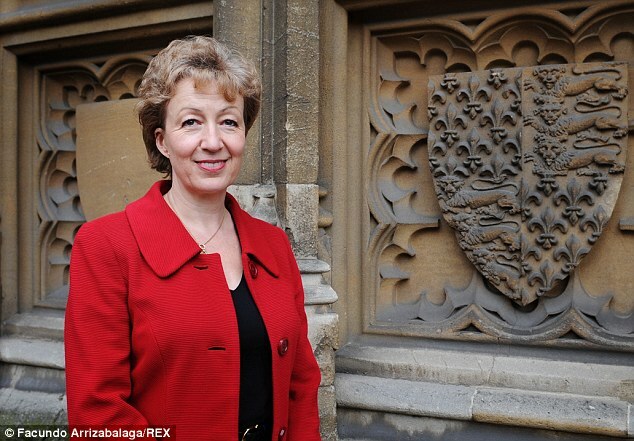 Mrs Leadsom also enjoyed a successful career in the City before entering Parliament – making her well placed to rebut claims from the Prime Minister and others that the safe economic option is to stay inside the EU. Mrs Leadsom said the future for Britain outside of the EU – and the ability to control its own borders – was overwhelmingly positive. She writes: ‘The EU’s cherished freedom of movement for people within its borders puts enormous strain on our NHS, our education and our housing. Mrs Leadsom also challenges head-on a controversial claim by Education Secretary Nicky Morgan that older voters have a duty to vote In. Her comments came as the Leave campaign opened up a four-point lead in the referendum contest, according to the latest poll. The Out camp is on 43 per cent, compared to 39 per cent for remain. Some 18 per cent of voters told an Opinium poll for the Observer they were undecided. With all my heart, I believe the UK’s best days lie ahead of us. I am convinced that our children and grandchildren will face their brightest future, with a world of opportunity and possibility, if we decide on June 23 to vote ‘Leave’. We are the world’s fifth largest economy and, unlike many other countries in the EU, our economy is strong and growing. As a former Treasury minister, people ask me about the possible impact of leaving the EU all the time. What will happen to jobs, to foreign investment and businesses? What will our relationship be with Europe? What will happen to migration, to the pound, interest rates, and the economy? What are the prospects for our children? These are truly the critical questions, and I want to address them head on. Let’s start with jobs. In the UK more than 95 per cent of all businesses are small and medium enterprises, employing some 14.5 million people. The vast majority do not export to the EU, yet all have to abide by European rules and regulations which cost them time and money and add huge complexity to even the most simple business decision. What about big business? Why do leaders of some big companies prefer to remain in the EU? Well, the EU is convenient and it’s familiar. But as Stuart Rose, ex-head of M&S, admitted to a parliamentary committee, the real ‘disadvantage’ of leaving the EU for big business is that pay for British workers would rise. To my mind it is totally unacceptable that big businesses have, for more than a decade, been holding down the wages of UK workers by employing more and more EU migrant labour. How would leaving the EU affect interest rates and the wider economy? Well, currently interest rates among all developed countries are at historically low levels, and the UK is no different. This helps everyone who is borrowing to buy a home, or to finance their business. Inflation rates are also extremely low. There is no reason to think that in leaving the EU, there would be any change. Leaving the EU is a process laid out in treaty. Once the UK decides to begin that formal process, probably following a number of months of informal negotiations, there will be two years during which new legally binding agreements over trade and other issues are negotiated. The trade deals we secure will reflect not just the fact that we are one of the world’s most powerful economies. We are also the EU’s biggest trading partner, the key financial services centre in Europe and we also, of course, have a shared history through which our terms of trade in goods and services have become closely aligned over 43 years of EU membership. There will be enormous interest on both sides in ensuring the negotiations are successful and trade continues – after all, the EU exports more to us than we do to them. Nor would foreign investment into the UK be harmed. David Cameron has made an extraordinary denial that his Government is in disarray over the EU referendum – claiming a slew of bad headlines are all the media’s fault. The Prime Minister rejected suggestions he was taking the bitter campaign personally, and insisted that talk of splits at the top of the Tory party was just journalists ‘setting each others’ hair on fire’. In extraordinary remarks, he said he had no regrets over the way he had conducted the bruising contest so far, and even insisted he had not made a personal attack on Brexit campaigner Boris Johnson. Since the start of the referendum battle, Work and Pensions Secretary Iain Duncan Smith has resigned with a furious blast at the PM and Chancellor. And anonymous briefings have suggested fellow Out campaigner Michael Gove faces the sack when it is over. Ministers have also clashed publicly over whether the new Living Wage is likely to drive up immigration – with Culture Secretary John Whittingdale and Commons leader Chris Grayling lining up on the opposite side of the argument to George Osborne. Debate has also raged over whether the NHS would be safer with Britain inside or outside the EU. But Mr Cameron still insisted there was no problem, telling reporters: ‘We said there was going to be a clear Government line on Europe, which there is, and ministers are able to depart from it and make their arguments in their own way. The world hasn’t stopped turning, the Government hasn’t stopped operating. ‘You all go around setting each others’ hair on fire and getting very excited about this but it’s all a lot of processology. I can’t see what the issue is. In the House of Commons – on the day after London Mayor Mr Johnson had declared for Brexit – Mr Cameron said he personally had no ambitions left to fulfil. This was widely seen as a knifing of Mr Johnson, suggesting he had only joined the Out camp to bolster his hopes of becoming Tory leader. But in comments that will raise eyebrows at Westminster, the Prime Minister flatly denied this had been a thinly-veiled personal attack. Speaking to journalists at last week’s nuclear security summit in Washington, Mr Cameron was asked if he was taking the heated referendum campaign personally. Critics are likely to seize on the strength of the PM’s rebuttals as a sign of mounting pressure over the vote – with the Out camp doing increasingly well in polls. We should have confidence in our country’s great advantages: we speak the world’s business language – English; we have the world’s best contract law, the highest rankings for culture, universities, and as a place to live and bring up children; as well as the benefits of a time zone that straddles the US and Asia and gives us a pivotal role in world markets. Foreign investment, international trade and our global financial services industry would continue to thrive outside the EU. But what does leaving the EU mean for taxpayers? We can debate precisely how much money we hand over, but there is no doubt the EU costs Britain billions every year and this will grow as EU bureaucracy develops and expands its areas of intervention. All taxpayers would benefit if we stopped these contributions and spent the money instead on our own vital services. Preserving the existing levels of financial support for farming, fisheries and the poorer regions of the UK would still leave up to £10 billion a year of taxpayers’ money to spend on our hospitals, schools, potholes and the myriad of other priorities. So for families, what does Brexit mean? In terms of public services it is clear there is a huge benefit. The EU’s cherished freedom of movement for people within its borders puts enormous strain on our NHS, our education and our housing. When you are trying to get your children into a school, when you struggle to arrange a doctor or hospital appointment, or when you are trying to get on the housing ladder, you will benefit from leaving the EU because our country will be able to regain control over migration. There is also no doubt that migration has depressed wages at the lower end of the scale. The new UK National Living Wage is an excellent policy that will help many UK workers. But it will also encourage even more people to come here and compete for jobs from an EU where unemployment rates for young people in some countries is around 50 per cent. If you are unemployed or low-paid it is clear you would benefit from Britain leaving the EU. What of pensioners? Well as beneficiaries of public services, leaving the EU is clearly in their interest. But more importantly, many pensioners will have voted in 1973 referendum to join the Common Market and they will know that we were sold a false promise. The EU is no longer the Common Market, but instead a political project whose ambitions are nothing less than a single country called Europe. The gift of restoring sovereignty to future generations is one I think pensioners would be proud to grant, confident as they are in our great country and optimistic about our ability to succeed in the wider world. Finally, what of young people in the UK today? It is they above all who have the right to look beyond the dreary issues of process and bureaucratic negotiation and ask themselves what sort of country they want in ten, 20 or 30 years’ time. They will not have another chance. It is 40 years since we last held this vote. For young people the choice is clear. They can remain in the EU, tied to the Eurozone, unable to control migration, at the mercy of one of the greatest centralising forces we have seen in European history – and continue to suffer from a democratic deficit that has already created civil unrest in mainland Europe. Or they can seize this momentous opportunity, and embrace the four-fifths of the world that is outside the EU. Continue to trade with our European allies, yes, but build as well stronger trading relationships with the 2.5 billion consumers who make up the Commonwealth headed by our own Queen; with the fast-growing countries in the Americas, and with the developing economies of Asia, which together represent our future prosperity and opportunity. I believe the interests of the young and elderly, employees and taxpayers, all those who use public services, the low-paid and the unemployed, are all one. And they would be served by voting ‘Leave’. Previous Previous post: IF The EU Is Good For Britain’s Economy Why Is The EU Doing So Badly? Next Next post: Leading In Europe. 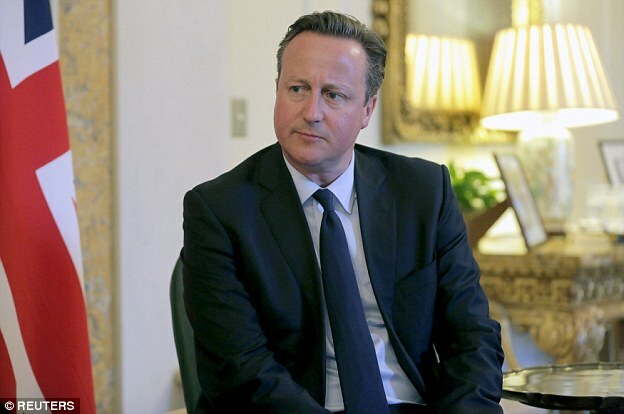 Cameron’s Deal To Remain Inside But Not Participate!